The 105th annual Drake Relays wrapped up last weekend in Des Moines at Drake Stadium. The world renown event collected competitors from all over Iowa, the United States and even the world. Bruce Jenner, Carl Lewis, Michael Johnson and Jesse Owens are a few of the hundreds of Olympic medalists to compete on the historical blue oval, including 25 Olympic medalists just last year. The CFHS men’s and women’s track teams were able to compete with high schools all over the state of every size. “It’s an amazing feeling knowing that you’re competing on the same track as some of the best athletes in the world, and the overall atmosphere of Drake makes you feel like you’re just as important as they are,” senior sprinter Kaz Brown said. Brown was joined by senior Melanie Stoss, senior Symone Robinson and sophomore Alicia Harrington in the 4x100m relay team that took home a sixth place finish. The men’s 4x100m relay team also fared well as they finished seventh. The young relay team consists of sophomores Michael Abbas and Denison Harrington, junior Matt Turcotte and senior Conner Riehm. The biggest controversy came in the men’s 4x400m relay after the Tigers won their heat and qualified for the final with the fourth fastest time. The team was disqualified after officials ruled that lead runner Sam Ahrenholz took a step out of his lane. The voluntary officials originally ruled that it was the third Tiger runner that stepped out before concluding that it was in fact Ahrenholz. 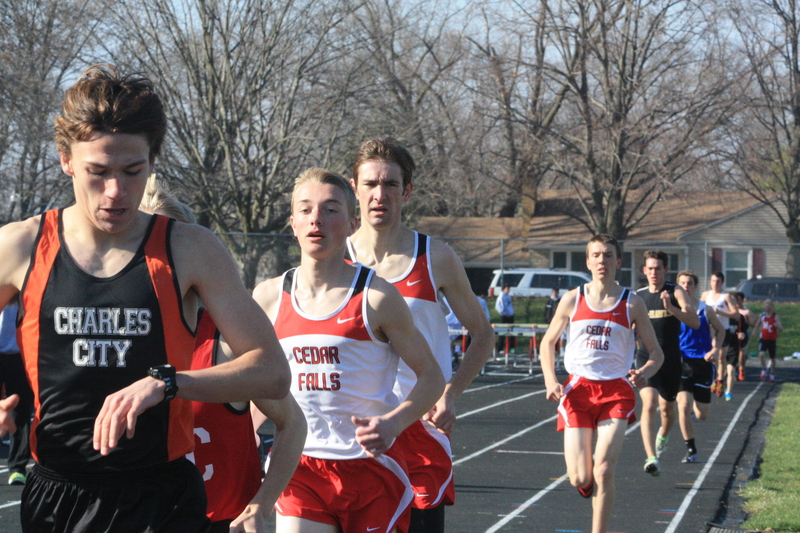 Ahrenholz turned his anger into motivation in the 4x800m relay where he ran a blistering 1:56 half mile in just his third ever competitive attempt at the race and had the Tigers in the lead after the first two laps. With senior Jared Failor missing Drake for the national robotics competition, sophomore Hunter Lavallee and junior Dylan Southall were joined by freshman Seb Gearhart, who replaced Failor, in the fifth place finish. “Seb did really well. Seb ran the best race he could have run. He’s going to be a stud in the next coming years,” Senior leader Ahrenholz said. With the State meet coming up on May 22-24, life still has plenty of time to run its course.